Our Training in the Great American Radio Auction! Body Master’s training is part of the Great American Radio Auction this year! We have 5 auctions available for 12 sessions of personal training or 3 months of our fit group training class! There are no reserves on these auctions, so they can be a great way to get some training at a reduced cost. 12 Session Personal Training – Your goals are our first priority. We will create a workout program for you that fits your needs. Body Masters provides a level of personal accountability that keeps you excited about health and fitness, but also keeps you on top of what you are working towards. Personal training also includes guidance on creating healthy eating habits and monthly measurements. We have multiple success stories. 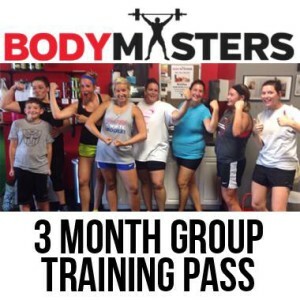 3 Month Group Training Pass – Good for 3 consecutive months for new members only. The owners and trainers at Body Masters want to create an environment that thrives on group mentality and focus. We take all the benefits of weight training, circuit training, cardiovascular training, and core development and correlate it with affordable prices and enjoyable for everyone. We also added an element of availability and convenience for our clients by holding class at 5:00am, 6:00am, and 7:00am, 5:00pm, 6:00pm, and 7:00pm (5:30pm/6:30pm on Friday’s) and 8:00 am on Saturday’s. With so many options, we have a class time that will allow exercising to fit into your schedule on almost any day! Contact us today to set up a time to try out your first two group classes, for free!